You’ll hit a home run with this delicious formula! 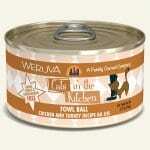 Made with chicken and turkey, Fowl Ball will make your cat a lifelong fan. So go ahead and step up to the plate...or bowl. Feed according to the age, size, and activity of your cat. 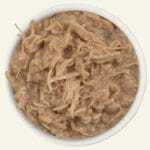 If fed alone, feed 1.0oz for each pound of bodyweight daily. Your cat should have access to clean, fresh water. Refrigerate after opening.